A fascinating aspect of Modern Spearhead is the integration of both land an air elements within the same battlefield space. Much of the detail of these air operations is of course subsumed into the mechanics of the rules. As a result only a portion of the technicalities are considered and then these only when they directly impact ground operations. This short article looks at the basics of air defence suppression in Modern Spearhead. I am a particularly convinced of the value of fixed wing air support. A successful strike even by a small number of aircraft can result in significant enemy casualties, ideally of high value targets. For a defender this can be critical as aircraft can target anywhere in the battlefield area, potentially delivering a critical blow to the attacker. For the attacker swift support by fixed wing aircraft can quickly overwhelm a difficult defensive position or disrupt a counterattack. Battalion level assets which typically include light man-portable surface to air missiles or gun based AA systems. These provide localised protection and are often of limited capability. 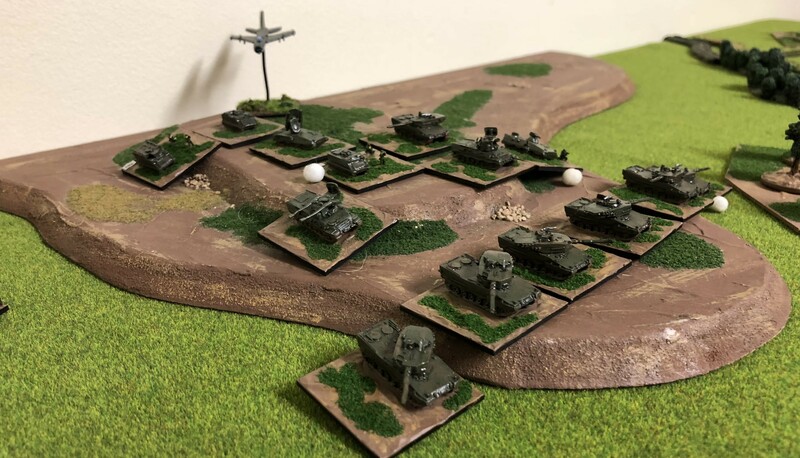 Examples include Gepard, Vulcan, Blowpipe, ZSU-23-4 and SA-7. The medium range surface to air systems with improved capability and that are allocated for point defence and are sometimes allocated for specific operations. Examples include Gaskin, Gecko, Rapier and Roland. Higher level systems which provide a wider umbrella for the divisional or corps. Typical examples include Hawk and SA-6 Gainful. An ideal air defence incorporates elements from all three. This will decrease the impact of airstrikes, either by reducing the effectiveness or in causing the aircraft attack to be broken off. Some systems will be mobile. Location through detection using radar location during the electronic warfare phase, followed by air defence suppression, or elimination, by long range divisional artillery fires in the artillery phase. Degradation of capability by radar jamming in the electronic warfare phase, immediately followed by airstrike. This is more difficult for WARPAC nations. Air defence suppression by the employment of fixed wing aircraft using smart bombs or anti-radiation missiles. Suppression of on-table air defence by attack helicopters. A combination of a number of these. Now let’s look at an example of air defence suppression. 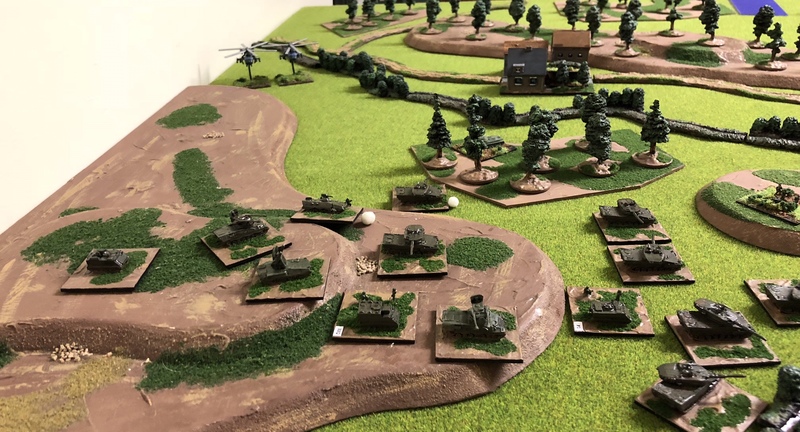 In our most recent game the Soviet defender, using a Naval Infantry Brigade, was subjected to a hasty attack by a West German Brigade. The German main effort comprised two battalions, including a Panzer Battalion equipped with Leopard 2s tanks. This battalion was further supported by Roland platoon and two Gepard platoons. No West German off table SAM could assist the advancing battalions. With much of the Soviet land based weapon systems challenged by the Leopard capabilities the reduction of these was critical. Therefore the Soviet commander attempted to suppress the West German air defences before launching an air attack on the Leopards. The attacks played out in the following order. First was an attack by SU-17 Fitters armed with smart bombs. Smart bombs are a stand-off weapon meaning the Gepards were unable to engage. The target was a Roland and Leopard and the aircraft was engaged with Roland at a -2. The artillery suppression were ineffective due to the German vehicle types. With the Roland operational the SU-17 Fitter attack was aborted by effective, or more accurately lucky, missile fire. Next the Soviets attempted suppression of the massed AA assets of the battalion by BM-21 rocket launchers. The SU-17 smart bomb attack, below, was repeated. This time the aircraft did not abort, however the smart bomb attack was unsuccessful in its attack. The Soviet commander then committed his naval Helix attack helicopters, grouped into two flights, to suppress the AA systems. They can be seen below attacking at long range and were therefore outside Gepard range. One Helix flight was effectively eliminated by Roland platoon, the other failed to successfully attack. 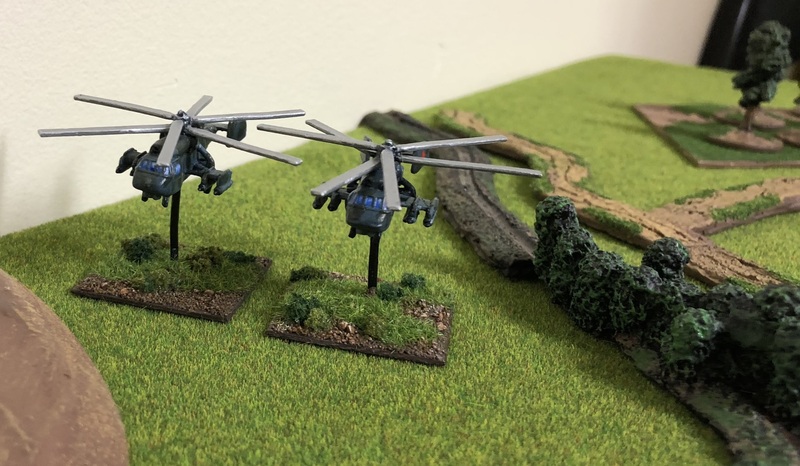 Below, another view of the squadron of Helix helicopters comprising two flights, each model represents 2 to 4 actual aircraft. With the BM-21s reloaded a second rocket strike fell on the West Germans, this time suppressing a Gepard. The remaining Helix conducted another attack, now destroying a second Gepard which had moved into range but was unsuccessful in its own attack. Simultaneously, a Yak-38 Forger attacked Leopard tanks using improved conventional weapons. 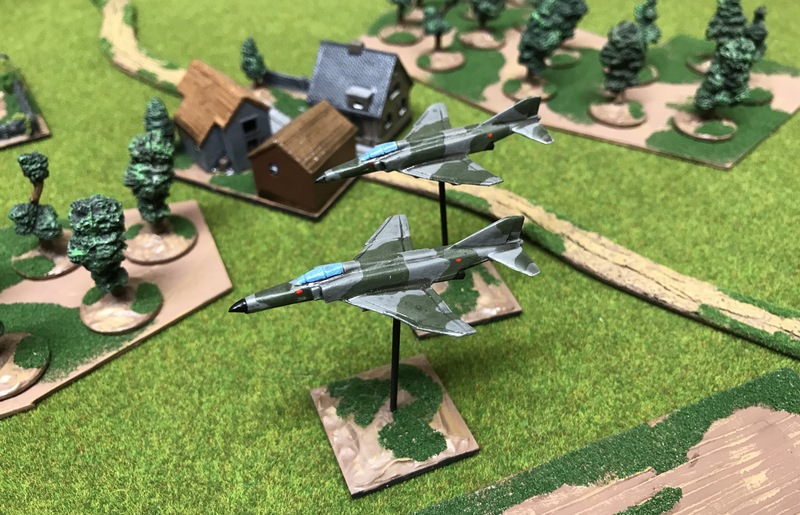 Below, the Yak-38s attempt an attack run on a West German Panzer Battalion. Fortunately, for the Leopards the Yak was shot down prior to completing its attack run by Roland. In each attack the West Germans were generally fortunate. They suffered few suppressions from artillery fires and their systems performed well when engaging attacking aircraft or helicopters. The German decision not to support the attack with off-table SAM was flawed, and of course was a result of limited resources. The Soviet failure to jam German radar reduced the effectiveness of the fixed wing aircraft and I am sure will not be repeated. The Soviets are also known to be evaluating their use of improved conventional munitions, aircraft squadrons and smart bombs. 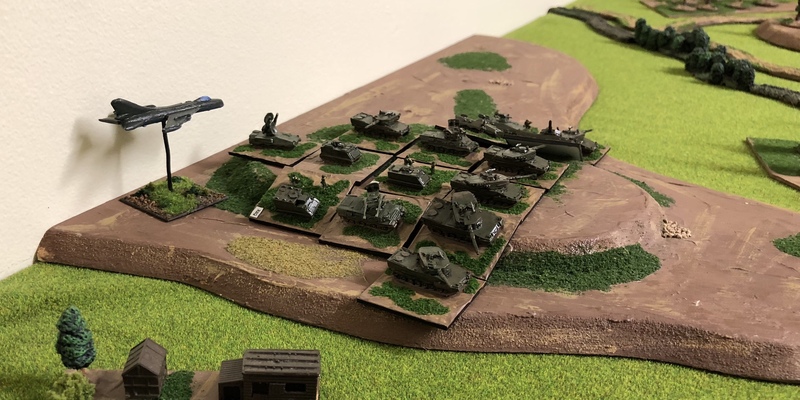 A fascinating example of air support and air defence suppression on the table.